Molly and Lauren founded the Kind Campaign in 2009 when attending Pepperdine University in California. Since then, they have traveled around the United States spreading their message of KINDNESS. Did you know Molly and Lauren only visit 70 schools each year? We are so lucky to welcome them to Marshall! Their documentary, Finding Kind, which we will watch during the assembly, has won numerous awards and has been shown in thousands of school across the WORLD. Molly and Lauren's message is based around KINDNESS and POSITIVITY. They remind us of the STRENGTH we have when we work together rather than against each other. Nothing but LOVE! Marshall is HONORED to welcome Molly and Lauren and EXCITED to have this AMAZING opportunity! 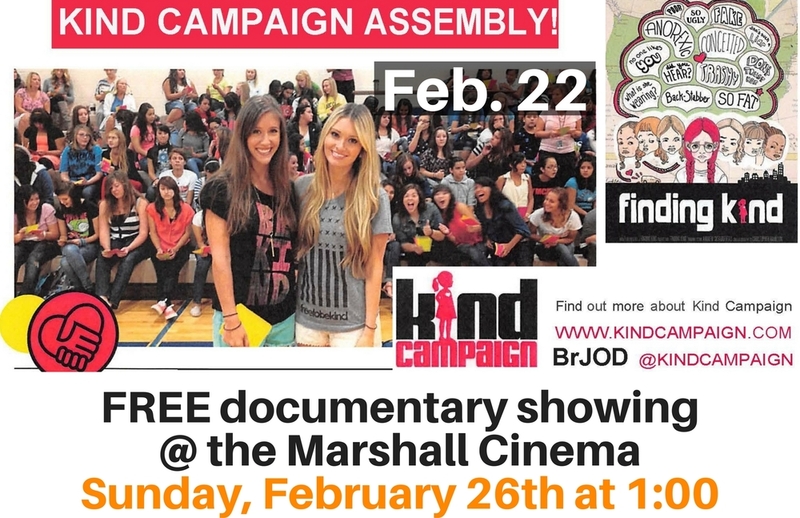 There will also be a FREE showing of the documentary, Finding Kind, at the Marshall Cinema on Sunday, February 26th at 1:00!